For lovers of Italian food, traditional delicatessens are a veritable Aladdin’s cave of treasures, from cured meats, to cheeses, pastas, vinegars and oils. Enter one of these pleasure palaces and the eyes are bombarded by famous names, while the nostrils fill with an array of aromas that together would make up a crowd pleasing antipasto plate.The big problem given this wealth of choice is where to start? What to buy? Which brands to choose? The answer is staring you right in the face, or rather, more likely smiling pleasantly in your direction. Yes, the deli owner. Ok, fine, but there’s another problem - simply that too many shoppers feel intimidated by the thought of seeking advice. While Italian-speaking customers come and go, their purchase punctuated by a how-do-you-do before taking leave with their parcel, the deli virgin is left standing in the aisle, or hiding behind a conveniently placed stack of ciabatta, hoping nobody has noticed their presence. 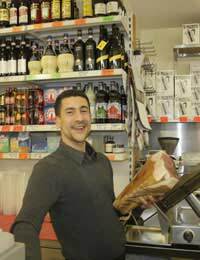 Next time you are near Farringdon Road, be sure to drop in and take a look at the range Gazzano’s offers. Alternatively, locate your nearest deli and experience food shopping a world away from the supermarket aisles. Oh yes, and please don’t be shy. If you hunger for knowledge about Italian food, remember; you only have to ask.